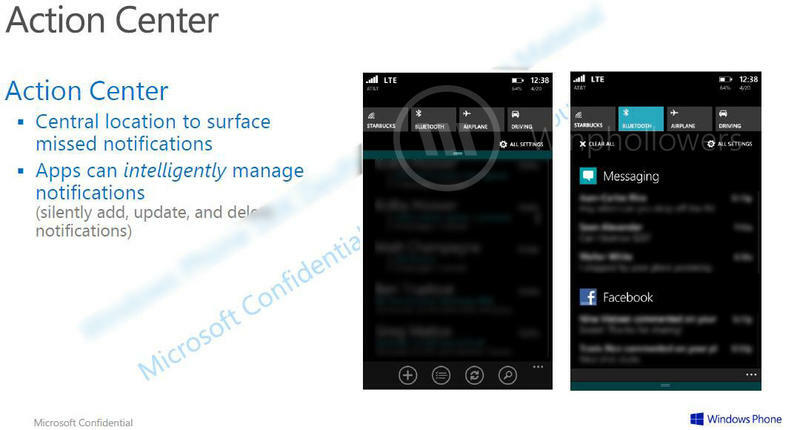 Winphollowers obtained an image of the new Action Center that WPCentral says it can confirm is the real deal. The new replacement for Action Center will not only alert you to new events in your apps, but it will also give you a more centralized hub for actions such as turning your Wi-Fi, Airplane Mode and Driving Mode on and off. As for notifications, the heart of this new tool, the leaked slide says that “apps can intelligently manage notifications,” and that means things such as delaying notifications to roll in at a time that better suits your schedule. This is something every mobile operating system should be implementing to be quite honest. There are also some minor tweaks shown in this image that are actually part of Action Center, but answer some requests users have had for some time. Under the battery icon in the top left you can now see a battery percentage has been added along with the date. While not major items in and of themselves, it does give us some indication that Microsoft has truly been taking the requests of users to heart. There is still no word on when exactly Windows Phone 8.1 will be rolling out, but with the Build Conference coming up in April, it seems as though that would be a logical time to announce major updates when you have all of your developers in one place and ready to start working on a new operating system.